Note: This series on piped bindings begins on August 4. The next step, joining the ends in a mitered corner, looked tricky but was fairly easy. Working with the beginning tail of the piping/binding combo, I folded it to the front of the quilt and finger pressed the fold into the binding. I opened the binding again and folded the quilt on a 45 degree triangle and lined up the raw edges of the quilt and binding. 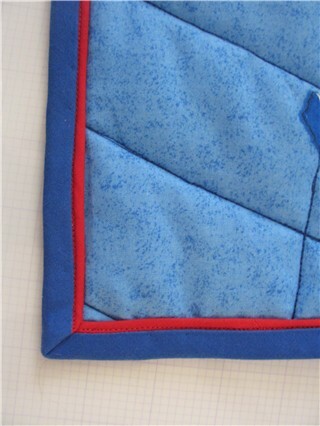 In the picture above the fold is in the blue binding right next to the red piping. Also note how the quilt sandwich is folded in a triangle. I used a 45 degree triangle to mark the miters on the binding. 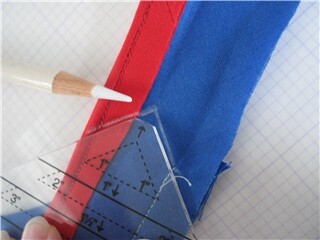 A ruler with 45 degree markings would also work. 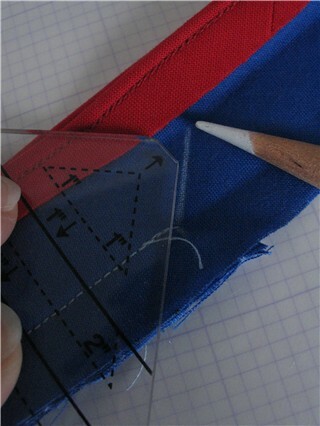 The first line was from the last stitch in the corner to the fold. 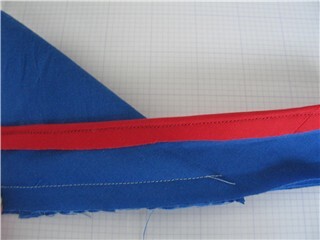 The second line was from the fold to the finished edge of the piping. 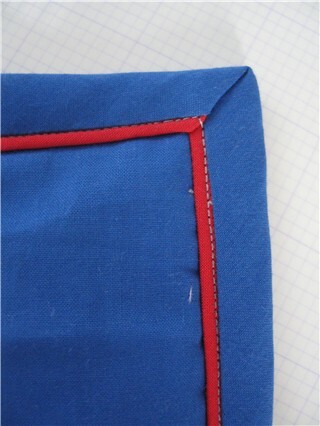 I stitched these lines making sure that the finished edges lined up. 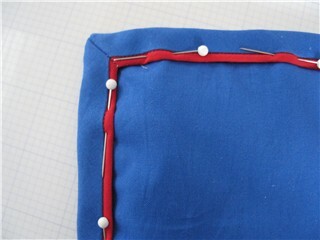 I backstitched at each end to secure and trimmed the seam allowances. I turned the binding to the front and Viola! I had a mitered corner. How cool! I turned the remainder of the binding to the front of the quilt and pinned it carefully in place. I found that taking the time to pin everything precisely saved time in the long run. and through the backing in the ditch next to the binding on the back. 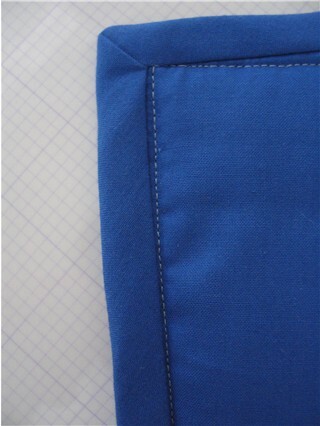 On these samples I used a white thread so it would be easy to see the stitching lines. 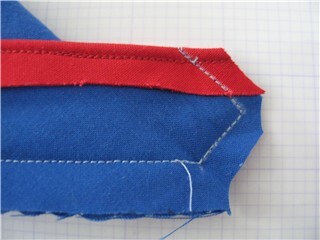 On the real quilt, my piping was red and my backing was blue so I used a red thread in the needle and a blue thread in the bobbin. So that is how I did it. 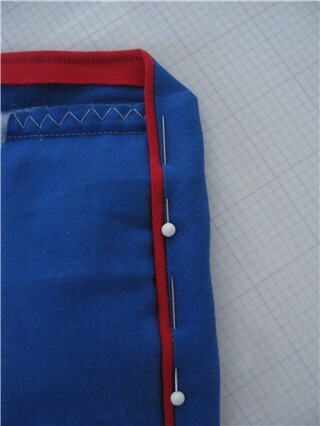 I would love to hear how others do a piped binding also. We can never have too many tricks in our bags!! It looks easy when you do it! 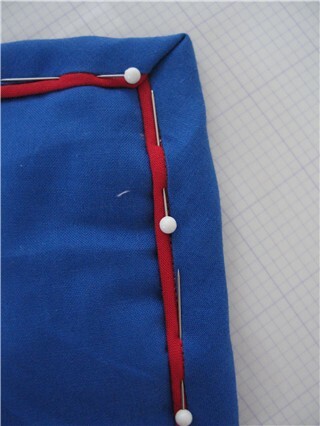 I like the idea of no hand sewing on the back and I do love the way piping looks. May try that soon. THanks again for the tutorial. Thanks for the tutorial, Deb! I really love the way the piping looks; it adds such a nice detail. I love the neat, concise way you’ve told and shown the world (and me) how to do this. I plan on trying it myself very soon. Thanks again! Very very nice. Crisp. And thanks for the tutorial. Cool! Thanks for the tutorial. I’ll have to try that.